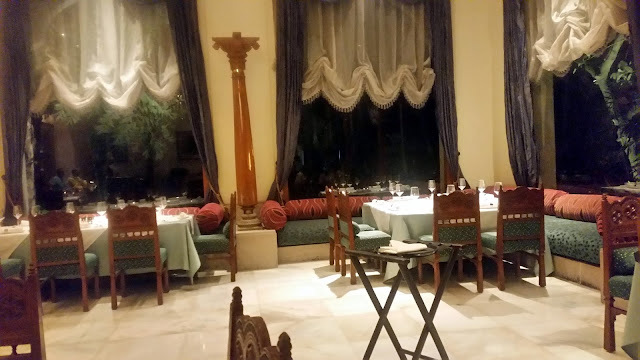 For one week till 27th February, Firdaus at Taj Krishna will turn into a true paradise for lovers of Kashmiri cuisine. The Kashmiri Food Festival here will showcase the delicate traditional dishes from the valley. Curated by Waza Tariq from Vivanta by Taj, Srinagar, the festival gives the Hyderabadi food lovers a chance to savour the delicacies of the Kashmiri aristocracy. 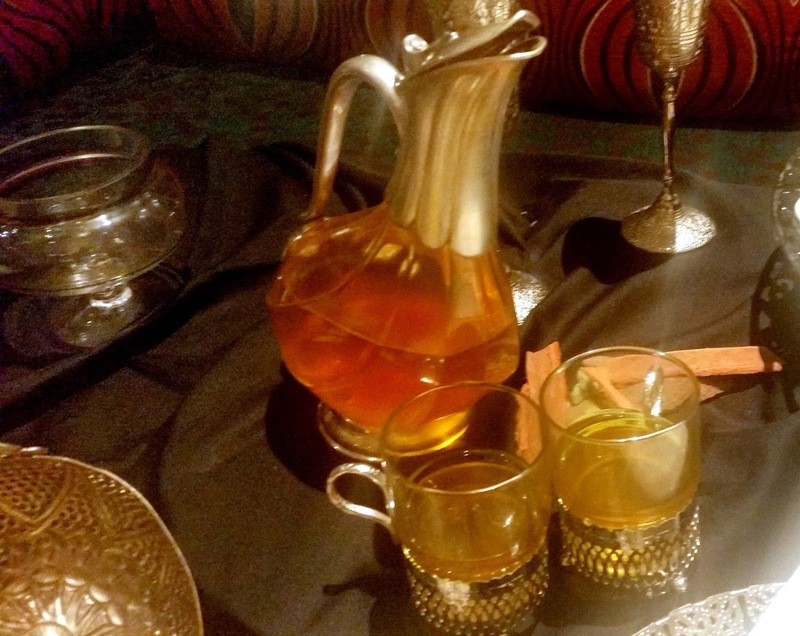 Wazwan is the traditional sit-down dinner in Kashmir. A huge number of dishes are served in this fare, most of which are preparations of meat. At the media preview for this festival, Chef Tariq explained to us the significance of Wazwan and the importance of using the right ingredients and processes to prepare the food. He took pains to explain in detail the preparation of the items. After a look at the display of the traditional dishes, I was eagerly waiting for the food to come in. We started with a couple of appetizers. Chicken Kanti is a well-known street food in Srinagar, served in the kababs shops in Khayam Chowk. The boneless chicken prepared in stir fried onions was a good dish to start the meal. Nadru Malai Tikki, a lotus stem and paneer kabab was soft, and went well with the Walnut Chutney served with it. 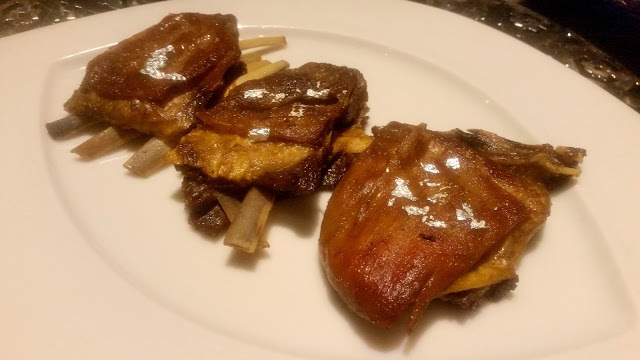 Tabak Maaz, or lamb ribs fried in yoghurt is possibly the best known starter in the Wazwan. Chef Tariq explained that though this dish should be well cooked, care should be taken that the twice cooked meat does not come off the ribs. 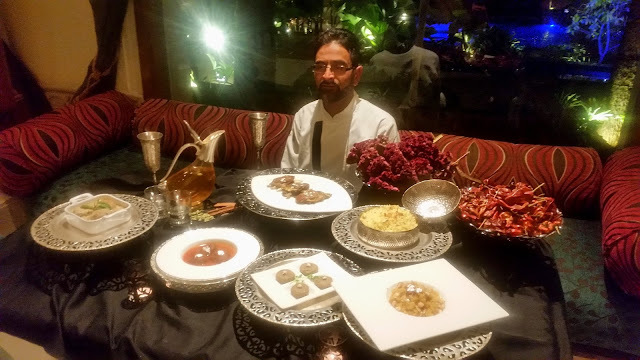 The Tabak Maaz here was as good as those served in some of the best restaurants in Kashmir, and definitely deserved a second helping. The Chef decided to serve five items from the main courses. 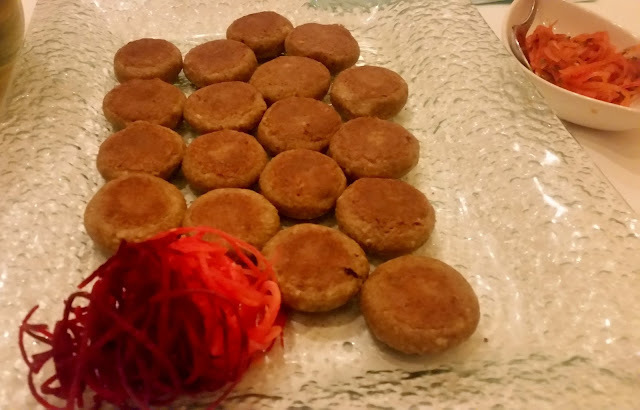 Rishta and Gushtaba, the twin mutton dumpling dishes were two among them. 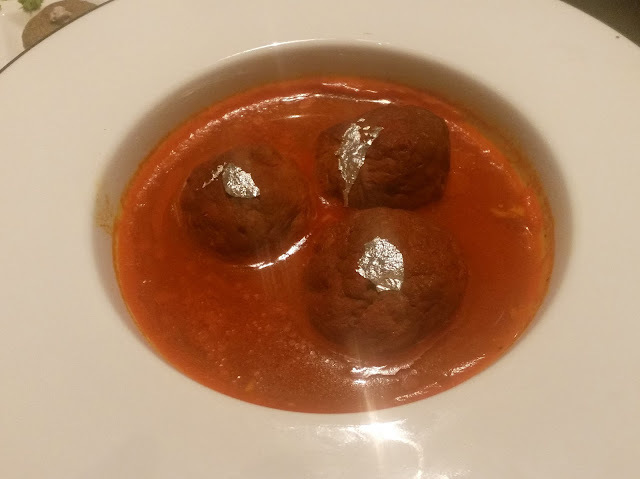 In Rishta, the dumplings were cooked in a zaffran and chilli based gravy. The mutton mince had really been pounded well to a soft texture. The spicy gravy was silk smooth and I tried it with the laccha parathas served with it. Gushtaba on the other hand, had a yoghurt based gravy. 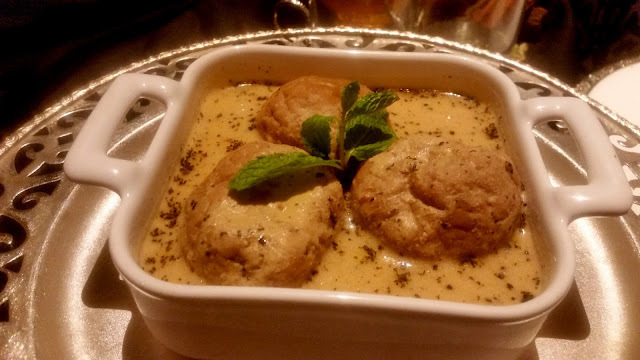 I was reminded of my experience of trying these delicacies at Ahdoos, Srinagar. Rogan Josh, perhaps the most well-known Kashmiri dish was savoured next. The Chef explained that in this preparation uses Maval a Kashmiri flower to provide the colour. Rogan Josh has two different preparations among muslims and pandits in Kashmir, this was the former version. There was Kashmiri Pulao served with it. Among the vegetarian dishes, Rajma Gogje was brilliant – a recipe of smaller local rajma beans with turnip. 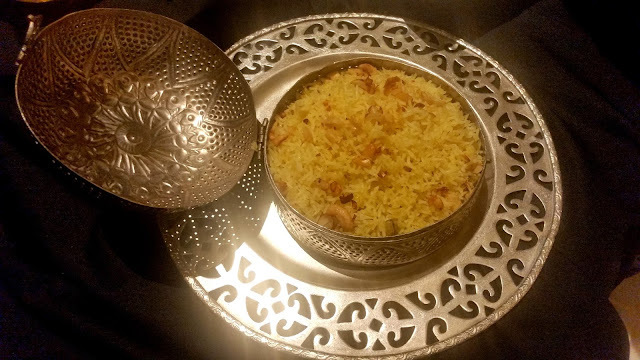 Kashmiris are avid rice lovers and this was a perfect recipe for having with rice. I had some with phulkas too. On first look, the gravy of Nadir Yakhni looked similar to Gustaba, but on tasting, I found them to be different. Among home food in Kashmiri cuisine, Haak the leafy vegetable stands out. I remember the chef in our houseboat in Srinagar used to get fresh haak from the Dal Lake and cook some soul food for us. So I was happy when my friend specifically asked for haak to be served, and we just loved it with rice. Finally it was dessert time. 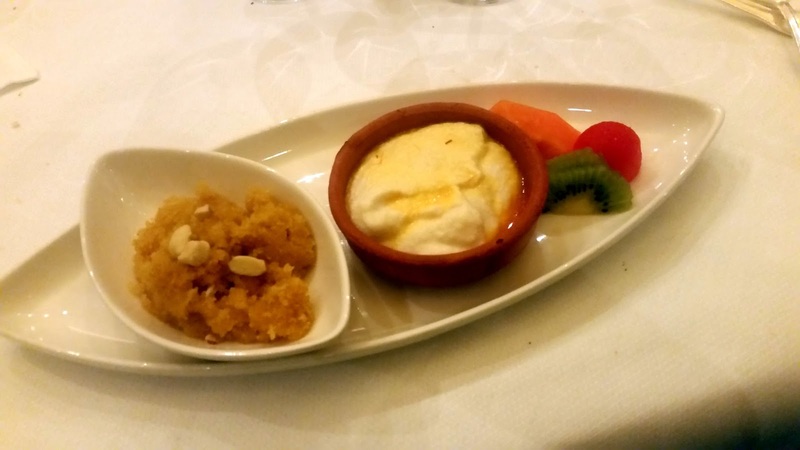 I did not like the Kesari Halwa, which was too dry for my liking. The Chef assured me that this is how it is prepared. The almond based Badam Phirnee was a winner, smooth and not too sweet. We ended the meal with some awesome Kahwa. Hyderabadi food lovers had their first taste of Wazwan through a mediocre Kashmiri restaurant which closed down couple of years ago. The festival will give them an opportunity to try out the real recipes of the traditional feast. The festival at Firdaus is a-la-carte, serving a wide range of other signature Wazwan items also, such as Yakhni Gosht and Waza Chicken.